❤🎿 Ski-in Ski-Out Cedars Townhome - Save $s Rent from Owners! Cedars Townhomes - We've vacationed summers and winters in Breck for 15 years and always admired the Cedars. Finally, we bought one. Come share our home. Guests rave! You won't be disappointed... With this great location, you can be first on the slopes and ski home for lunch. Stroll one block to Main Street for fantastic shopping and dining, summer and winter! Enjoy hot cocoa and share the day's ski stories around the warm cozy fireplace. townhouse for great privacy. The master bedroom has a king-size bed with a 40-inch flat screen TV and the second bedroom has a queen and a trundle bed which is like two twins. It also has a flat screen TV. The master bedroom has sliding glass doors to a balcony overlooking the courtyard. There's also a queen-size sofa sleeper in the living room. gas grill for our guests to use. There's also a washer and dryer in the townhouse for your convenience. The attached heated garage is a great place to store ski equipment and clothing and your summer recreation toys like bikes! Please call area code 970-, four eight five, four six 12 for any questions you may have. City, fishing, hiking, championship golf and much more! This is a good location with a condo large enough for several people. But beware that there are multiple levels so you'll be walking up and down stairs a lot. The kitchen was well stocked. The Location of the Cedars condo was perfect for our ski trip, walking a short distance to the lift and worked great to come back for lunch and short lift lines after. The kitchen has everything you could need for cooking meals, town is just a short walk, the garage was great as it is heated and our ski equipment was ready to go in the morning and my pickup fit easily. Anytime I had any questions for Shareen she would get back to me right away. We would definitely stay here again. Thanks so much Jeff for taking the time to review our townhouse. I am so glad to hear that you enjoyed your stay and would love to have you stay again! It was my pleasure to answer your questions! We had a great time during our stay in Breckenridge. This townhome was not quite ski-in, ski-out but it was a very short walk to get to the Quicksilver lift and a short walk for ski rental and ski school. The shops and restaurants in the downtown area were within walking distance too. The only driving that we did once we got there was to the city market. More than enough room for our group of 5. Very comfortable sleeping arrangements. The townhome was very clean when we arrived. The kitchen had everything we needed for cooking meals. The bathrooms were very nice and updated. The heated garage was great to keep the vehicle from getting covered in snow and it kept the ski gear warm overnight. Plenty of room in the garage for medium sized SUV. The only issue we had was that the pool was not on site. It was down the road and across the street. Apparently several facilities share the pool/hot tubs and it was very crowded and not very kid friendly when we tried to go. Overall, this was a great place to stay and I would not hesitate to stay there again on our next trip to Breckenridge. Adam, Thank you for yet another 5-star review and taking the time to leave your comments about your stay in our Cedars townhome. 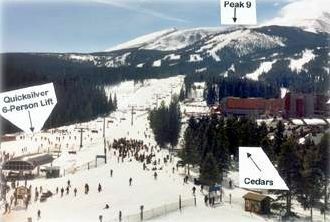 For the benefit of future guests, I am not aware of another property that is closer to the lift on Peak 9 than the Cedars. There are some units in the complex that are a few steps closer than ours but The Cedars has always been at the top of the list of true ski-in ski out complexes. We have a very good cover picture on our VRBO website showing how close we are to the lifts. As for your issue with the pool location, I do clearly state in our description that the pool is located about 1/2 block away. If guests prefer to drive rather than walk there is a parking lot at the pool.. There are also lockers and showers so you can get dry before returning to the unit. Please contact me about the pool not being kid-friendly as that bothers me and I will discuss that with the manager! It sounds like overall you had a great time which is our goal for all our guests. We hope you will think of making our townhome your home base again if you have another chance to visit Breckenridge! I have rented a variety of properties around Breckenridge over the years and have generally concluded that the units around the "Village", with quick access to Peak 9 and the town of Breckenridge are ideal. Shereen's place is very well situated (I would concur with a description of Ski-in/Ski-out), well appointed and extremely comfortable. My only "knock" on the place is that it is an older place construction-wise and so the windows are not double pane (it was very cold while we were there and ice formed on the inside of the windows upstairs but we stayed warm!) and the pool/hot-tubs are at a community facility across a major street and down a half block. But these are nits and the property description on these points is accurate. The layout of the unit is excellent, the furniture/beds are well above average for a rental unit and the location is outstanding. It is certainly on my list for future trips to Breck - hard to beat!! Thank you for your response, Rick. Yes, that second bedroom upstairs can develop frost on the inside of the windows. We have installed insulated blinds and when closed they do help a lot. Glad to hear that you did stay warm and this didn't affect you having a good nights rest! We are considering replacing the window but the association has chosen replacement windows that require you not only replace the window but also the outside siding needs to be modified. This gives us a small window of time to complete this while the weather is cooperative! We look forward to hosting you when you visit Breck again! This Condo was Wonderful! - don't hesitate!! We had never been to Breckenridge before. We are a family of 4 who wanted to be close to mountain ( 5 Peaks -which one?) & try to be close to town. So glad we decided not to stay directly in town - it was very busy at night - think it would have been too noisy. Shereen's place was perfect! It's next to the Quicksilver lift (takes you to greens & blues and easy transfer to other lifts)& 3-5 min walk to the beautiful & fun town! First of all from the get go - Shereen was so available, answered ALL my questions & more - her many emails on the condo/shops/ restaurants/ lifts, etc, was so helpful. She really made the trip wonderful :) before we even got there! To me, getting that attention & feeling so comfortable - made the trip that much better. The condo is sooo cozy! I really felt like I was at home. It had a "woodsy" theme & was perfect for the four of us. Two big bedrooms with tons of closet/storage space. The kids room had a queen & twin with trundle & their own bath!! It looks like they have recently installed new Berber carpet & bathrooms look redone. The pictures don't do the condo justice! There were so many supplies (paper towel, soap, spices, olive oil, etc) & pans. There's a closet off kitchen, which has any leftover supplies from other renters. So saves on what you have to buy. The condo's garage is heated - which is awesome! Left all our ski equipment in the garage everyday, our boots were never cold-Huge plus! Got our gear on & walked out the door to the lifts. Super Convenient. I don't know what the other reviewer was saying about it not being a true ski in/out - it certainly is! Quick walk out the garage door & over a little footbridge to the lift. Coming home you ski back over the bridge pop skis off & a couple steps to walk back. Came home for lunch most days which is such a BONUS - especially since we decided to eat at the mountain one day(approx $20 per) - it cost us more than dinner out in town!! It was a fantastic place to stay. Would rent again from Shereen in a heart beat. It was a great place for our family to stay for a White Christmas vacation. It had everything we needed and is in a great location. Refer to calendar for availability. Contact us about our cancellation policy.